Have you heard of Sidekix? They are a fun new toy that transforms from a soft ball into a cute stuffed animal friend, recommended for ages 3 and up. 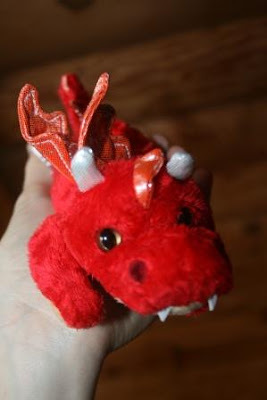 There are many different styles to choose from, and the one we received is a dragon named Inferno. One of the best features about Sidekix is that they have magnets in their feet. So you can attach them to anything metal. Pierce had a wonderful time taking Inferno about the house to see where he would stick, and where he wouldn't. 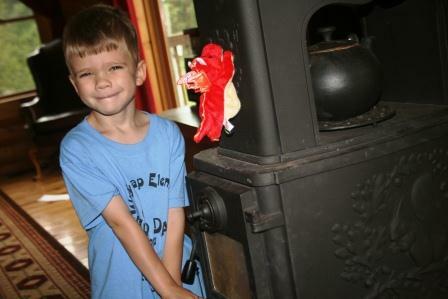 I guess Inferno likes things hot, so he took to the woodstove right away. Just a couple of things we weren't crazy about with the Sidekix. You might note from the first picture that the zipper is plastic. Well the zipper was difficult to navigate, and when I was trying to help the boys unzip it one of the teeth broke off, so we were no longer able to use the zipper. This happened the first day we had the toy. The other thing is that the Sidekix has a loop on it so you can clip it to a backpack, but ours did not come with a clip. 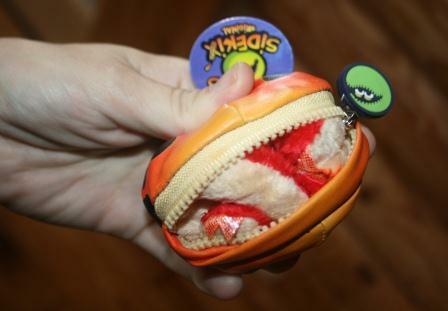 I'd love to see Sidekix upgrade their zippers and include clips with all of their toys (I think at this time the clip is included with the barnyard chick). Aside from that, the boys really enjoyed playing with Inferno, and it's a cute and very huggable toy. I love that it's small in size, versatile, and doesn't take up a lot of space. Want to enter to win one? Click on the "Read More" below to enter! Disclaimer: I received one Sidekix toy for review purposes. The opinions stated above are my own. pretty cute toy, but sounds as if the need to improve the quality a bit! 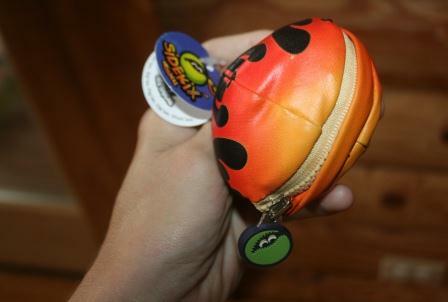 It looks like a really cool toy, and it would be cool if they would upgrade the zipper, too so it would last longer. 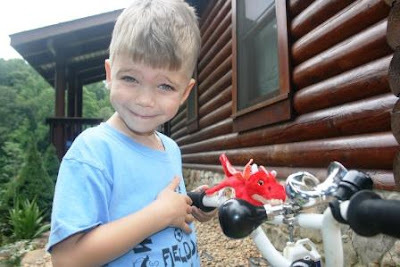 My Grandson also had trouble with the zipper. They are very cute though. These are cute! I like the Panda and the Zebra, especially. Too bad the zipper broke so quickly. Very different indeed! People are always coming up with new gimicks, aren't they? I like the Barnyard Chick. I like the dragon! So cute! Mojo, the dog, is my favorite. Inferno the dragon is my favorite. With 5 dragon lovers in my household, Inferno is definitely my favorite. I love the "Click A Dee Chick A Dee"!It's super cute! My favorite would have to be Savannah the Zebra! I like Inferno the Dragon the best! My daughter would love the zebra! I like Click A Dee Chick A Dee! I like the Bamboo Panda one. Chick a Dee is my favorite. Can't wait to see the others they come out with in the barnyard line. i like the chicken and the egg one. I like Safari (Zebra) and the Best Friends (Dog). Too cute!! kristiedonelson(at)gmail(dot)com Thank you. I think that my girls would love either the dog or the dragon.